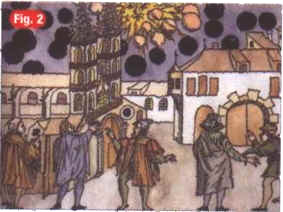 This picture by Samuel Coccius illustrates the occurrence of a UFO sighting as the large orange and black spheres over Basel, Switzerland in 1566AD. The picture is held at the Wickiana Collection, Zurich Central Library. More about UFO in historical painting on the website http://homepage.ntlworld.com/m.hurley. But this lie seemed too little for them. Now in the Internet the idea, that the inhabitants of the Niburu are our gods, is advanced very actively. They had supposedly created world religions, and even sent Jesus Christ (?!) to teach peace all over the world. And this is not enough; they are our gods-creators. It was them who created a man by added two missing chromosomes to the genetic code of monkeys with purpose to get precious metals for them. On the Sumerian relief of 6 thousand years old we again see (see page 120) angels-hybrids priests with little buckets in their hands. There is an angel in the center. He is floating in the air without the help of wings. He represents the sun god on this relic. The symbol of the sun god is the disk with wings (was discussed above) which came from Sumerian religion to Babylonian, then to Egyptian and then to all the Mesopotamian religions. Fallen angels always like when people treat them as gods. Nothing is changed, only their argumentation acquired more scientific like appearance. For the proof of the given absurdity these lost souls trying to pull the facts like pulling Cinderella's shoe on the meaty foot of her sister. The idea obviously limps. However, many people get on the hook. Zecharia Sitchin with his book «The 12th planet» was the first to push this idea forward. Having studied the Sumerian tablets of 6000 years of age he came to conclusion that such extensive knowledge could have been received by the Sumerian people only from Niburu. Besides, obvious mystification turns round the figure 12. That Niburu is the 12th planet, 12 Niburians ruled the Earth and consequently in Egypt, Greece and Rome there were 12 gods. Sounds fascinating. But is it true? In solar system besides the Sun itself there are only 9 planets. So Niburu is the 10th planet. But, trying to adjust the facts, the supporters of idea of hybrid origin of the man, include in the list of planets the satellite of the Earth - the Moon. But why not include in the list 2 moons of Mars, 16 moons of Jove or 18 moons of Saturn? And in Ancient Greece there were really 12 Olympic gods, but above them Zeus and Gaea ruled, and it means, that there were 14 gods on the Olympus.